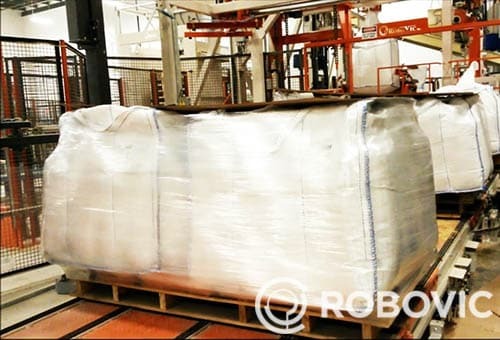 Fully Automated Tote/Big Bag Filling System | ROBOVIC Inc.
Robovic’s automatic big bag filling system is intended for high speed production. This system is fully automatic from placing, filling and closing of bag. It was developed to handle various products such as : grain, powder, aggregate and granular products. The distinction attributed to the automatic filling system resides in picking up the bag directly from a pile. 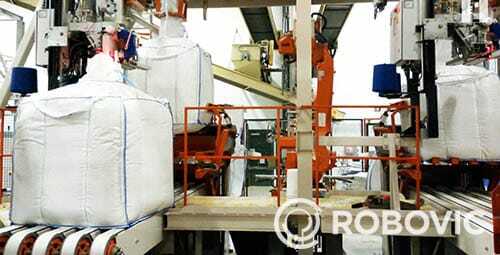 The bags thus stacked on top of one another on the pallet therefore retain their competitive prices despite their functionality dedicated to automation. The THS bulk/big bag filling system operates with maximum robotic capacity. A first robot locates and assures bag pick up, one at a time, from one of two piles then positions it precisely on the bag support. 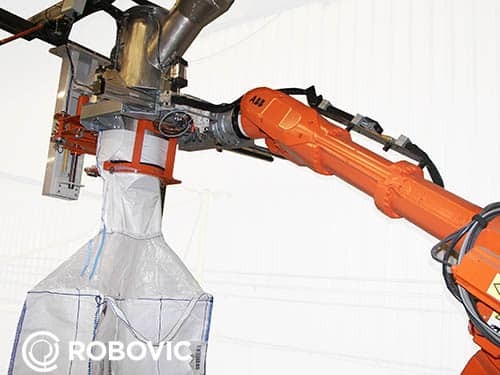 A second robot grasps the bag and positions it to the filling spout and ensures to guide the previously filled bag to the closing system. The THS bulk/big bag filling system incorporates a hopper, weighing modules, a spout specifically designed for automatic operations and a vibrating elevator adaptable to your product. The system can handle bags from 250kg to 2 tons. The THS robotic filling system can incorporate one or two weighing-filling systems to reach speed of 30 or 55 bags per hour. In order to obtain efficient packaging, the big bag filling system can integrate several options such as: wrapping, tagging, a balance conveyor for optimal product weight control and an automatic pallet distributor. Bag pick up directly from pile. Bags from 250kg to 2 tons. up to 30 to 55 totes per hour. Stacking manipulator for 1 to 4 bags per pallet. Weighing system and controlled filling. Tagging on one or two sides of the bag.